I have had the unique experience of serving in the Peace Corps in Korea and of having taught English in Iran. I was evacuated from Iran during the 1978-79 Islamic Revolution. The movie, "Argo," greatly mirrored my own evacuation experiences in Iran. I also travelled through Afghanistan just before the 1978 Communist overthrow of the Afghani government. Selected readings: Four AWP Conferences, four South Atlantic Modern Language Association Conferences; three Southern Festival of Books; Emerald Coast Writers' Conference; Chicago Harold Washington Main Library; The Barbican Library, London, England; Writer in Resident at Lakenheath American Middle School, Ely, England; Peace Corps Conferences; Shakespear and Co., Paris, France; Motlow College Writers' Festival; Twentieth Century Literature Conference; Poetry Society of America's Midwest Regional Conference; Alabama Public Television; Midwest Modern Language Association Conference; others. Dr. Virginia Gilbert has a Ph.D. in Creative Writing-Poetry and English from the University of Nebraska-Lincoln, a MFA in Creative Writing-Poetry from the Iowa Writers Workshop, and a B. A. in English from Iowa Wesleyan University. Gilbert also worked at the Academy of American Poets setting up its free workshops called "The Writers's Community" and the Academy's library. A number of her haikus have been selected for Split This Rock's favorite "Postcards to the President" and have been posted on their blog. Gilbert served as a Peace Corps Volunteer from 1971-73 in the Republic of South Korea. She taught English in Iran, and was evacuated from there during the Islamic Revolution in the late seventies. Besides these activities, Gilbert was a consultant for a book on Alabama Poet Laureates, and was an advisor for the fine arts magazine, The American Muse. 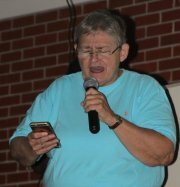 She has been a judge, among others, for the Peace Corps Poetry Contests and for Alabama State Council on the Arts grants. Besides being a poet, Gilbert is also a noted photographer, having won a number of local, national and international awards including a Special Merit Award--Kodak International Newspaper Snapshot Award for 1986 and "The Best Nebraska Entrant" in the Seventh Annual Cornhusker International Exhibition of Photography. She has won five Best Pictures of the Year Awards from the Huntsville Photographic Society and is ranked as one of its Master Photographers. Currently, Gilbert is Professor Emerita of English at Alabama A & M University, and was its long time Director of its Program in Creative Writing and its reading series. She is also a former President of the Huntsville, Alabama, Photographic Society and is a former President of the Huntsville branch of The National League of American Pen Women. She is a recent Members Assembly Secretary to the Arts Council of Huntsville, Alabama. Gilbert was a 2017 finalist for the Virginia Hammill Simms Award for volunteer support for the arts in Huntsville. Awards: 2009-10 Alabama State Council on the Arts Individual Artist Grant for Literature; 2006 University of Nebraska-Lincoln Alumni Achievement Award; 2003 nomination and selection of chapbook for Pudding House "Greatest Hits" series; 2001 Alabama Poet of the Year; 1998 First Place, Alabama State Poetry Society Slam Competition; 1997-98 Alabama Council on the Humanities Speakers' Bureau Presenter on the topic; "Transformation of a State Through Poetry"; 1995 Nomination for Alabama State Poetry Society's Book of the Year; 1993 Hays Fulbright Scholar to the People's Republic of China; 1992 First Place, Sakura Festival Haiku Contest; 1990 Second Place, Hackney Literary Award; 1990-91 Faculty Development Grant, Alabama A & M University; 1984-87 Fellowship in Creative Writing-University of Nebraska-Lincoln; 1976 National Endowment for the Arts Fellowship-Poetry; 1965-69 Harlan Award, Iowa Wesleyan College; Finalist, Pitt Poetry Series and Chowder River Review chapbook contests; others.